Texas Instruments (TI) has announced the addition of new microcontrollers with integrated signal-chain elements and an extended operating temperature range to its MSP430 value line portfolio. New MSP430FR2355 ferroelectric random access memory (FRAM) MCUs allow developers to reduce printed circuit board (PCB) size and bill-of-materials (BOM) cost while meeting temperature requirements for sensing and measurement in applications such as smoke detectors, sensor transmitters and circuit breakers. 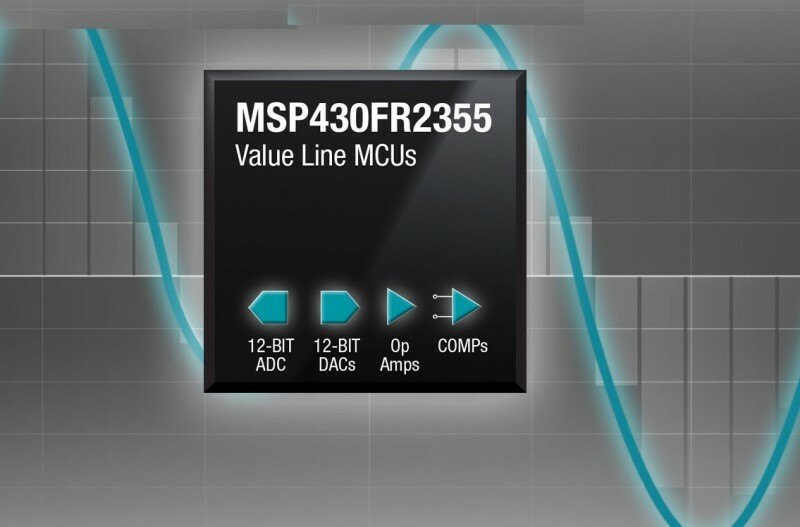 Engineers can enjoy more flexibility in their system design with MSP430FR2355 MCUs, which integrate smart analog combos—configurable signal-chain elements that include options for multiple 12-bit digital-to-analog converters (DACs) and programmable gain amplifiers, along with a 12-bit analog-to-digital converter (ADC) and two enhanced comparators. Developers can use MSP430FR2355 MCUs for applications that require operation at temperatures as high as 105°C while also benefiting from FRAM data-logging capabilities. Engineers gain more options to select the right memory and processing speed for cost-sensitive applications with the MSP430FR2355 MCUs, which add options to the MSP430 value line FRAM MCU family by offering memory up to 32 KB and central processing unit (CPU) speeds up to 24 MHz. Designers can also scale to the rest of the MSP430 FRAM MCU portfolio for applications that require up to 256 KB of memory, higher performance or more analog peripherals. Developers can start evaluating with the MSP430FR2355 MCU LaunchPad development kit (MSP-EXP430FR2355), available for US$12.99 from the TI store. 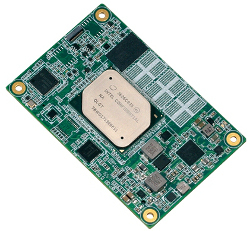 iWave Systems has partnered with SoC-e for enabling HSR/PRP IP on iWave’s Zynq 7000 SoC SOM Module. iWave has rigorously validated SoC-e’s High-availability Seamless Redundancy (HSR) and Parallel Redundancy Protocol (PRP) IP Protocol on our Zynq 7000 SoC based SOM module. iWave’s Zynq 7000 SoC SOM and SoC-e’s HSR/PRP Switch IP Core reduce the time-to-market and simplifying design complexity. SOC-e develops IP portfolios for leading-edge networking and synchronization technologies for time critical systems. The Zynq-7000 programmable SoC family integrates the software programmability of an Arm-based processor with the hardware programmability of an FPGA, enabling key analytics and hardware acceleration while integrating CPU, DSP, ASSP and mixed signal functionality on a single device. 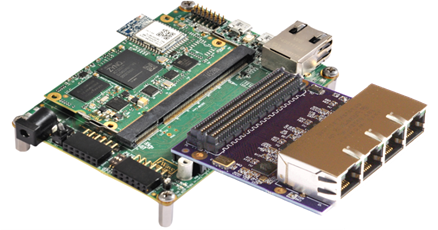 The iW-RainboW-G28M (Zynq 7000 Board) is a featured-full and ready to-operate embedded software and advanced circuit development kit built around the smallest member from the Xilinx Zynq-7000 family, the Z-7010. The Zynq-7000 SOM / Development Kit is based on the Xilinx All Programmable System-on-Chip architecture, which firmly incorporates a single / Dual Cortex A9 with Xilinx 7-series FPGA logic. 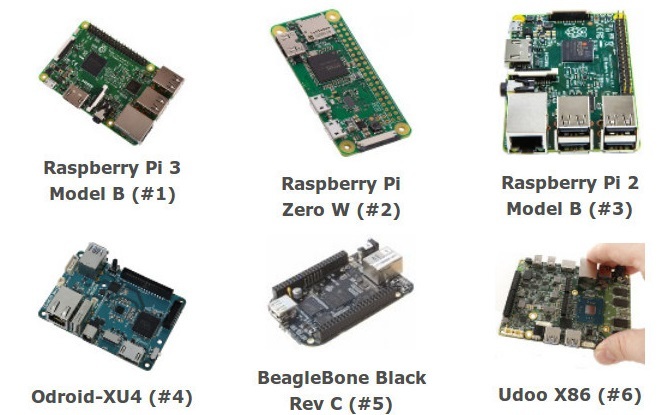 At the point when combined with the rich set of media and connectivity peripherals accessible on the Zynq 7000 SOM, the Zynq Z-7007S, Z-7014S, Z-7010, Z-7020, can host an entire design system. 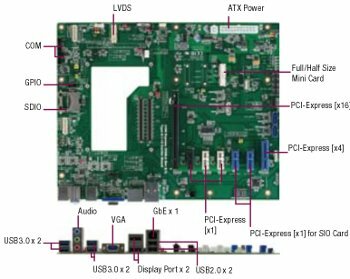 Memories, 512 MB DDR3 (Expandable to 1 GB) or 512 MB NAND Flash (Expandable), that are on-board, video and sound I/O, USB 2.0 OTG, Gigabit Ethernet and SD (4-bit) will have your board up-and-running with no extra hardware required. Moreover, PMIC with RTC bolster connectors is accessible to put any design on a simple development way. 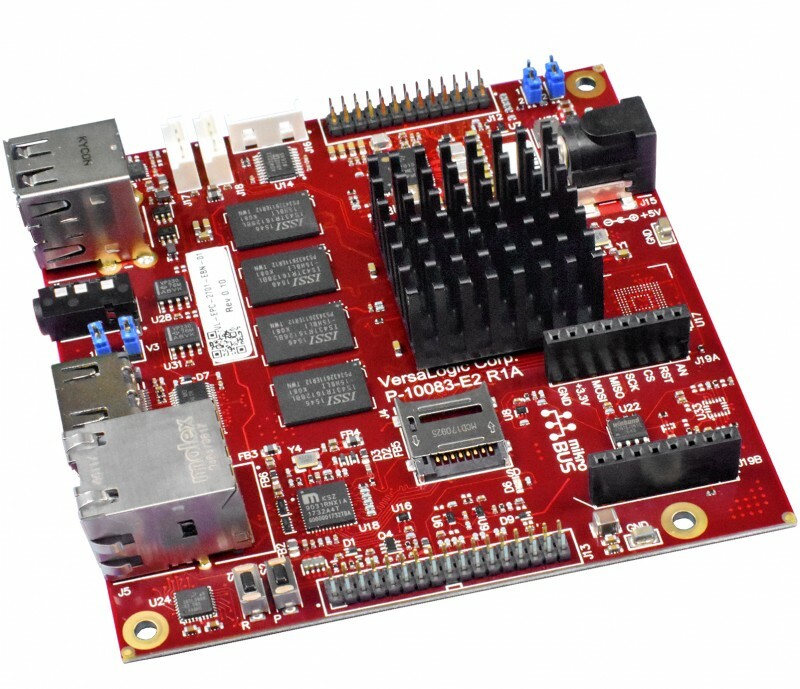 The iW-RainboW-G28M gives an ultra-cost to embedded designers that don’t require the high-thickness I/O of the FMC connector yet at the same time wish to use the enormous preparing force and extensibility of the Zynq AP SoC architecture. 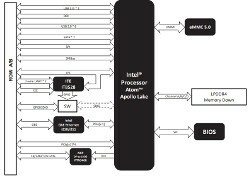 The NanoCOM-APL is an Apollo Lake upgrade for customers of Aaeon’s similarly COM Express Type 10 Mini form-factor NanoCOM-BT module, which runs on a Bay Trail Atom E3800 SoC. No OS support was listed for the factory automation targeted NanoCOM-APL, but we assume that like the NanoCOM-BT, it runs Linux, as well as Windows. Three Intel Apollo Lake SoCs are available: the quad-core Pentium N4200 and Atom E3950 and the dual-core Celeron N3350. The Pentium and Atom SKUs ship standard with 4 GB LPDDR4, and the Celeron model has 2 GB. Yet, Aaeon also lists a maximum capacity of 8 GB LPDDR4. The only other difference between the SKUs is that the Atom-based model is the only one with 32 GB eMMC 5.0 storage, with an option for up to 64 GB. The low power consumption enables “hand-held, battery powered devices and fully enclosed IP67 applications,” says Aaeon, One early customer is already using the module combined with an FPGA and an AI chip for a machine vision system that can scan products to “create 3D images that can be checked for faults,” says the company. The vision system be integrated within a production line or a robotic arm. 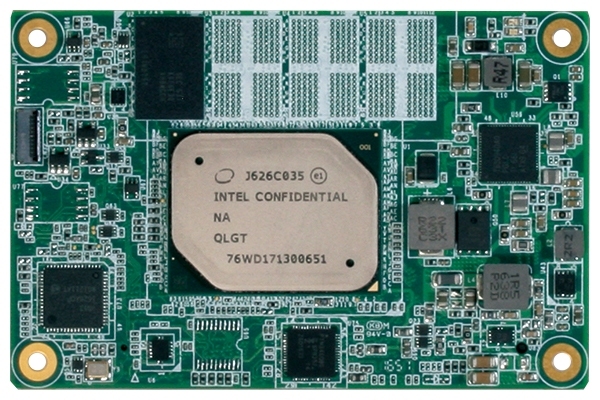 The NanoCOM-APL module is equipped with an Intel I210IT GbE controller with WoL, and offers dual SATA II interfaces. 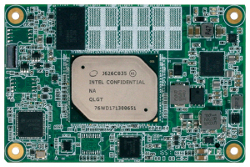 The Intel HD Graphics Gen9 drives an 18/24-bit single-channel LVDS interface (or optional eDP) plus a DDI connector that supports DDI, LCD/eDP, or LVDS. In the press release, Aaeon promotes the module’s dual MIPI-CSI interfaces. However, there’s no evidence for this on the product page, datasheet, or block diagram. The NanoCOM-APL supports 2x USB 3.0, 8x USB 2.0, 2x TX/RX serial, and an HD audio interface. You also get 8-bit GPIO, I2C, LPC Bus, SMBus, and PCIe, which can be configured as PCIe x4 or 3x PCIe x1. Like the NanoCOM-BT, the 84 x 55mm module is available in 0 to 60˚C and -40 to 85˚C models. A watchdog is standard, and a heatspreader and CPU cooler are optional. There’s a 12V power input with optional 5V, with both supporting AT and ATX. 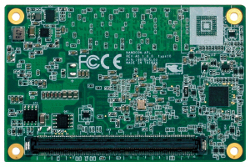 The NanoCOM-APL supports the same Aaeon ECB-920A carrier board as the earlier NanoCOM-BT. Coastline ports include dual USB 3.0, dual USB 2.0, dual DisplayPort, and VGA, GbE, and audio. 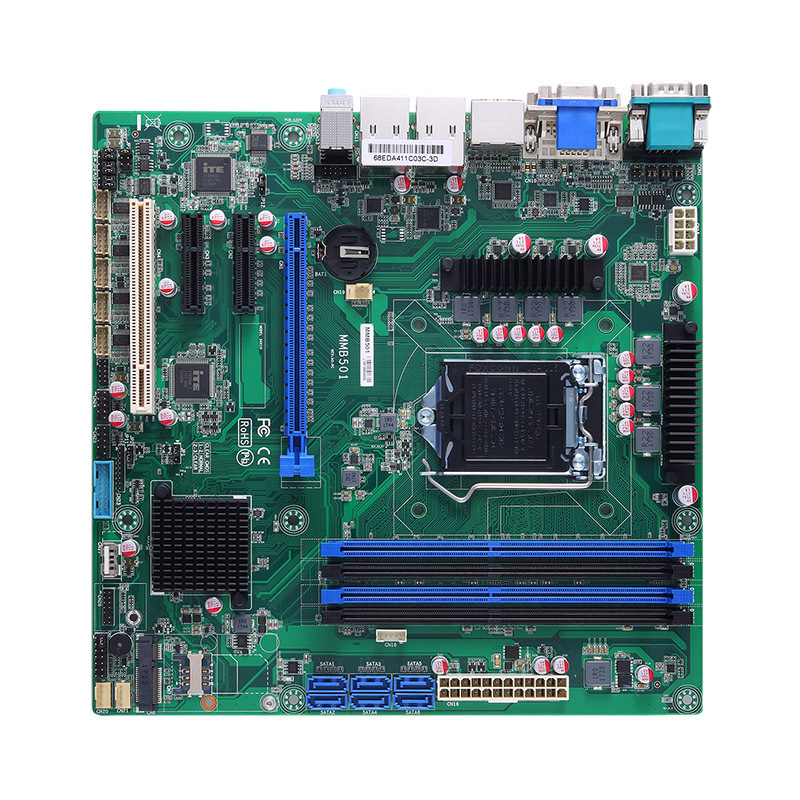 The ECB-920A also provides 5x PCIe x1 slots, as well as PCIe x4, PCIe x16, and mini-PCIe slots. Four SATA ports, dual serial ports, an I2C interface, and a debug port are also on board. No pricing or availability information was provided for the NanoCOM-APL module. More information may be found at Aaeon’s NanoCOM-APL product page. This article originally appeared on LinuxGizmos.com on June 12. Murata has launched its latest encapsulated DC-DC converters, designed specifically for use in industrial and railway applications. 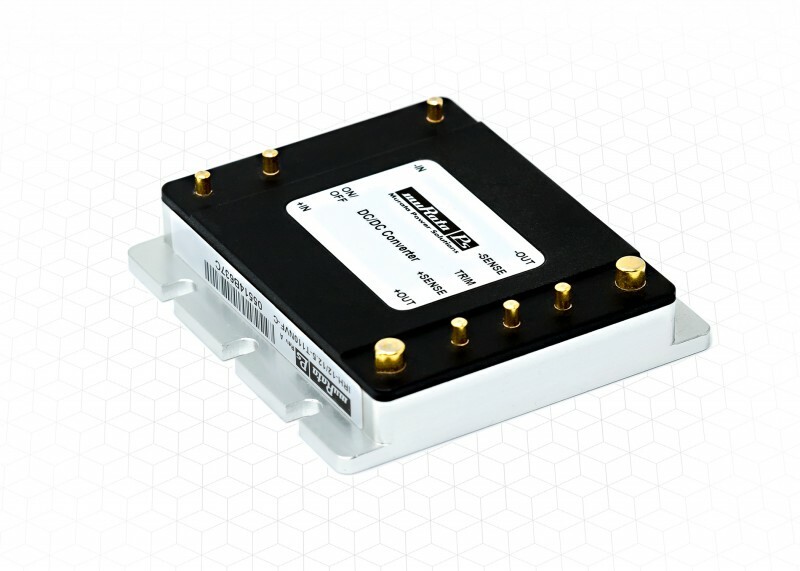 The 150 W IRH series from Murata Power Solutions provides market-leading power conversion efficiency, in an industry-standard half-brick pinout, using the latest component and packaging technologies in a fixed-frequency switching power supply architecture. Murata’s 150 W IRH series converter modules have been designed and tested to meet the requirements of EN50155. To improve thermal management, the IRH series is available with standard and flanged baseplate options, and with DOSA or alternate industry standard pinout options. The modules’ encapsulated circuit design makes them shock- and vibration-tolerant, with lower EMI and improved thermal performance. With these features, the IRH series from Murata Power Solutions offers the user flexibility and reliability in design implementation. The IRH series provide a wide 3:1 VIN range of 57.6V to 160 VDC that meet the requirements of the EN50155 standard for railway applications for a nominal Vin of 96 VDC and 110 VDC, including brownout and transient conditions. Standard features include on/off logic control and protection against short circuits, overvoltage and over-temperature. The IRH topology supports a pre-biased output at start-up, eliminating the reverse currents during system start and shutdown that can damage critical circuitry. The IRH DC-DC converters are designed for demanding applications in the industrial, railway, power – grid and transportation industries. Within these industries, specific applications include, networking equipment for mobile platforms, intermediate bus applications, smart grid communications equipment, lighting, fan trays, industrial and test equipment, and other applications requiring a regulated 5 VDC, 12 VDC or 24 VDC source. The galvanically isolated DC-DC converter modules provide reinforced input to output isolation with a withstand voltage of 3 kVRMS. Modules with outputs of 5 VDC at 30 A, 12 VDC at 12.5 A and 24 VDC at 6.25 A are available, each able to deliver up to 150 Watts of power. The modules efficiency ratings of 91% at 5 VOUT, 89.5% at 12 VOUT and 89% at 24 VOUT put them at the top of the industry for efficiency ratings. 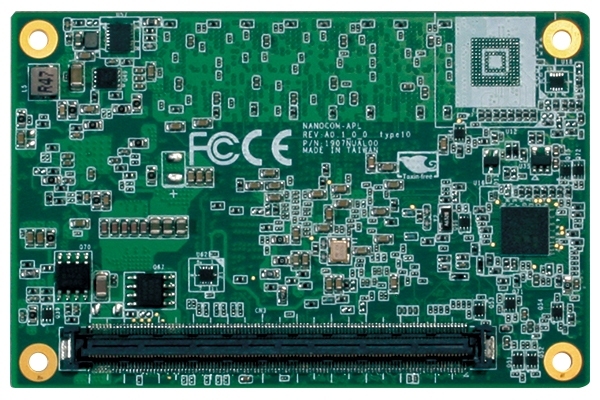 To accompany the modules an Evaluation Board is also available to allow users to test the parameters and specifications of the module either internally or externally to the application. Analog & Power. (7/3) This newsletter content zeros in on the latest developments in analog and power technologies including DC-DC converters, AD-DC converters, power supplies, op amps, batteries and more. Microcontroller Watch (7/10) This newsletter keeps you up-to-date on latest microcontroller news. In this section, we examine the microcontrollers along with their associated tools and support products. IoT Technology Focus. 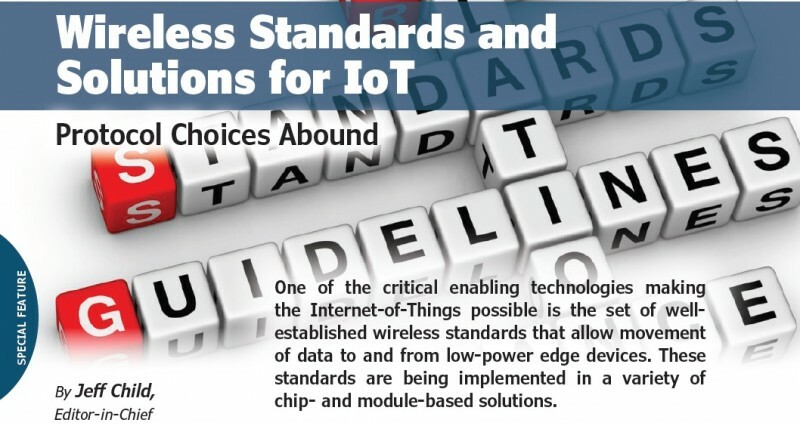 (7/17) Covers what’s happening with Internet-of-Things (IoT) technology–-from devices to gateway networks to cloud architectures. This newsletter tackles news and trends about the products and technologies needed to build IoT implementations and devices. Today’s small fans and blowers depend on brushless DC (BLDC) motor technology for their operation. Here, Ed explains how these seemingly simple devices are actually quite complex when you measure them in action. The 3D printer Cambrian Explosion unleashed both the stepper motors you’ve seen in previous articles and the cooling fans required to compensate for their abuse. As fans became small and cheap, Moore’s Law converted them from simple DC motors into electronic devices, simultaneously invalidating the assumptions people (including myself) have about their proper use. 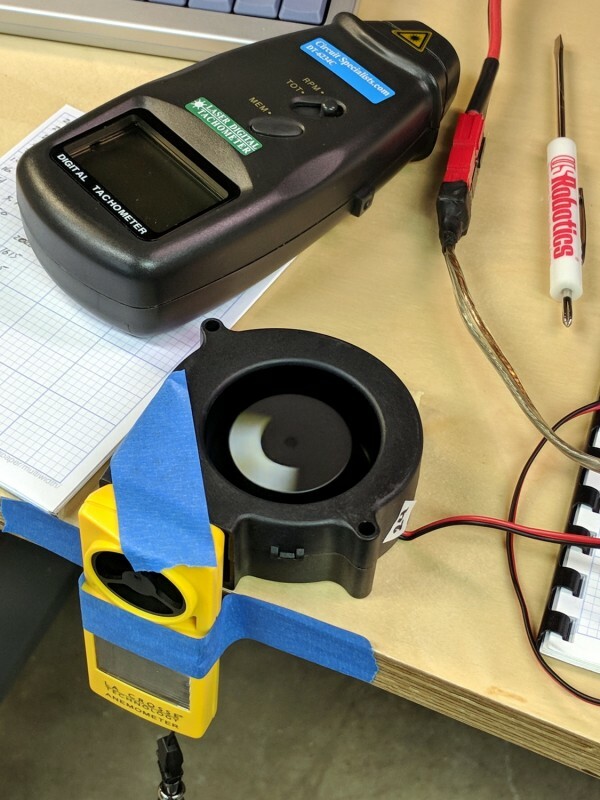 In this article, I’ll make some measurements on the motor inside a tangential blower and explore how the data relates to the basic physics of moving air. Electric motors, regardless of their power source, produce motion by opposing the magnetic field in their rotor against the field in their stator. Small motors generally produce one magnetic field with permanent magnets, which means the other magnetic field must change with time in order to keep the rotor spinning. 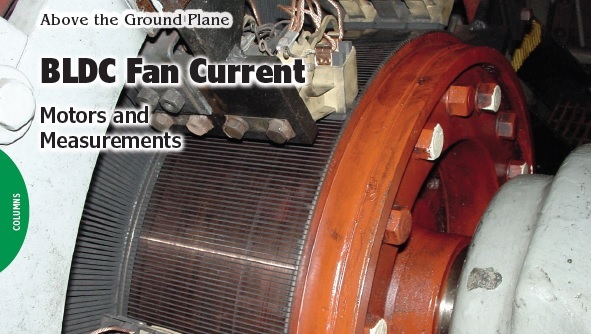 Motors powered from an AC source, typically the power line for simple motors, have inherently time-varying currents, but motors connected to a DC source require a switching mechanism, called a commutator, to produce the proper current waveforms. Mechanical commutators date back to the earliest days of motor technology, when motors passed DC power supply current through graphite blocks sliding over copper bars to switch the rotor winding currents without external hardware. For example, the commutator in the lead photo switches the rotor current of a 1065 horsepower marine propulsion motor installed on Fireboat Harvey in 1930, where it’s still in use after nine decades. Fireboat Harvey’s motors produce the stator field using DC electromagnets powered by steam-driven exciter generators. Small DC motors now use high-flux, rare-earth magnets and no longer need boilers or exhaust stacks. Although graphite sliding on copper sufficed for the first century of DC motors, many DC motors now use electronic commutation, with semiconductor power switches driven by surprisingly complex logic embedded in a dedicated controller. These motors seem “inside out” compared to older designs, with permanent magnets producing a fixed rotor field and the controller producing a time-varying stator field. The relentless application of Moore’s Law put the controller and power switches on a single PCB hidden inside the motor case, out of sight and out of mind. Because semiconductor switches eliminated the need for carbon brushes, the motors became known as Brushless DC motors. Externally, they operate from a DC supply and, with only two wires, don’t seem particularly complicated. Internally, their wiring and currents resemble multi-phase AC induction motors using pseudo-sinusoidal stator voltage waveforms. As a result, they have entirely different power supply requirements. The magnetic field in the rotor of a mechanically commutated motor has a fixed relationship to the stator field. As the rotor turns, its magnetic field remains stationary with respect to the stator as the brushes activate successive sections of the rotor winding to produce essentially constant torque against the stator field. Electronically commutated motors must sense the rotor position to produce stator currents with the proper torque against the moving rotor field. As you’ll see, the motor controller can use the back EMF generated by the spinning rotor to determine its position, thereby eliminating any additional components. The blower motor current varies linearly with its supply voltage, so the power consumption varies as the square of the voltage. The motor speed depends on the balance between torque and load. I originally thought Brushless DC (BLDC) motors operated much like steppers, with the controller regulating the winding current, but the switches actually regulate the voltage applied to the windings, with the current determined by the difference between the applied voltage and the back EMF due to the rotor speed. The difference between current drive and voltage drive means steppers and BLDC motors have completely different behaviors. The orange trace along the bottom of Figure 1 shows the current drawn by the 24 V tangential blower shown in Figure 2, without the anemometer on its outlet, for supply voltages between 2.3 V and 26 V. The BLDC motor controller shapes the DC supply voltage into AC waveforms, the winding current varies linearly with the applied voltage and, perhaps surprisingly, the blower looks like a 100 Ω resistor. An anemometer measures the blower’s outlet air speed and a square of retroreflective tape on the rotor provides a target for the laser tachometer. If you are doing this in a lab, you should build a larger duct with a flow straightener and airtight joints. 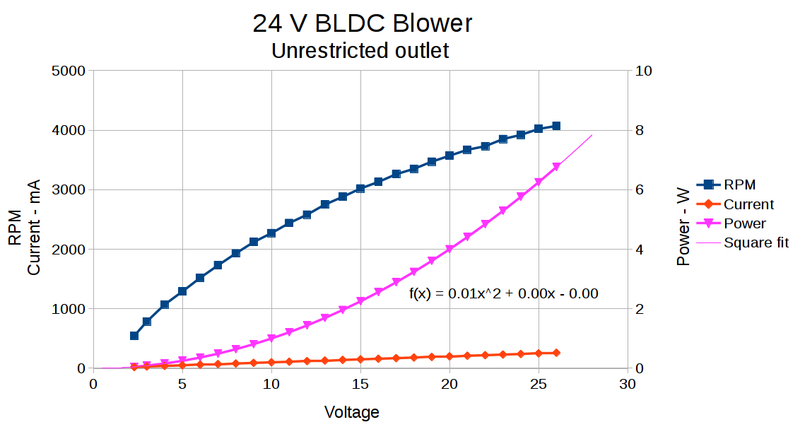 The blower’s power dissipation therefore varies as the square of the supply voltage, as shown by the calculated dots in the purple curve. In fact, the quadratic equation fitting the data has 0.00 coefficients for both the linear and constant terms, so it’s as good as simple measurements can get. Nordic Semiconductor has announced that Sikom, a developer of GSM-based IoT platforms, employs Nordic’s nRF52840 Bluetooth 5/Bluetooth Low Energy (Bluetooth LE) advanced multiprotocol System-on-Chip (SoC) in its ‘Bluetooth Thermostat EP’ to support smartphone connectivity and smart-home networking. 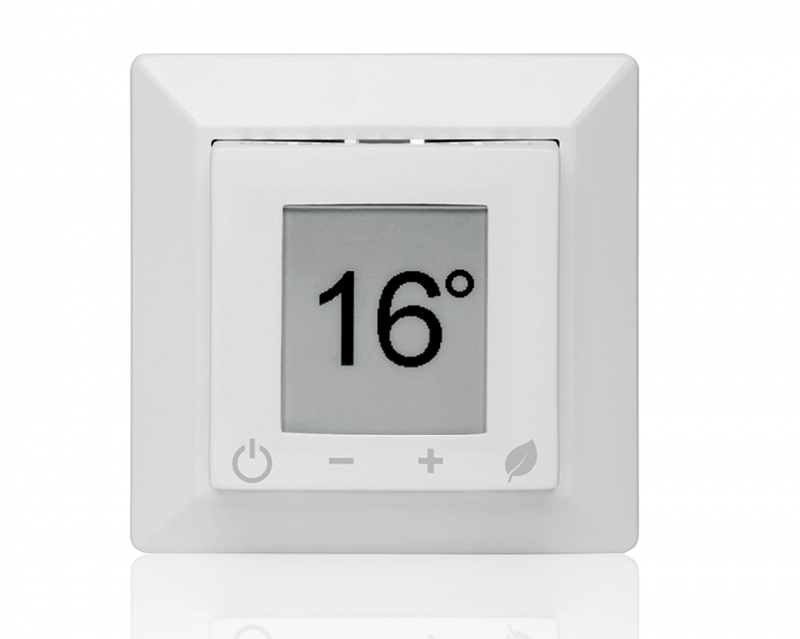 The thermostat is available to consumers and OEMs developing their own heating control systems. The Nordic SoC’s Bluetooth 5 long-range capability enhances connection stability, boosting range, and allowing the thermostat to be configured and controlled from anywhere in the house. From a companion app on a Bluetooth 4.0 (and later) smartphone the user can control thermostat features such as comfort and economy temperature set points, week programs, vacation modes and temperature logs. Because the thermostat can be controlled and configured directly from the smartphone, there is no requirement for a proprietary gateway between mobile device and thermostat, lowering the cost and complexity of installation and setup. In addition, the thermostat’s Bluetooth 5 connectivity enables it to join a Sikom smart-home network and communicate directly with other wireless devices to support advanced features such as power control and limiting. The thermostat also integrates with 4G/LTE (cellular) technology to enable remote control via Sikom’s Cloud platform. Enabled by the nRF52840 SoC’s 32-bit Arm Cortex M4F processor, 1 MB Flash memory, and 256 KB RAM, the Bluetooth Thermostat EP platform can support a variety of complex remote thermostat/heating applications. The processor has ample power to run the Bluetooth 5 RF software protocol (“stack”) and Sikom’s application software and bootloader. The SoC also supports Over-the-Air Device Firmware Updates (OTA-DFU) for future improvements. Nordic’s nRF52840 Bluetooth 5/Bluetooth LE SoC is Nordic’s most advanced ultra low power wireless solution. 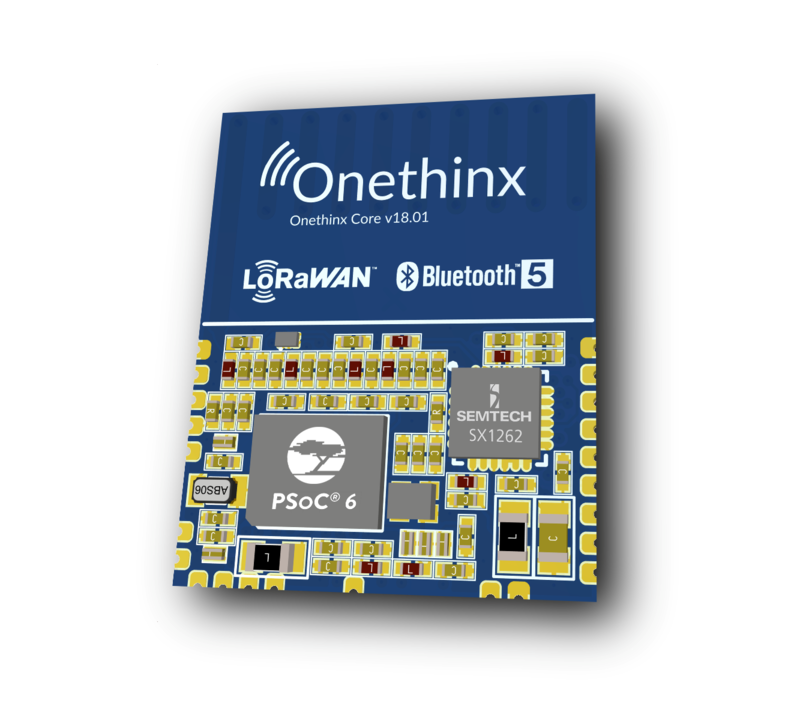 The SoC supports complex Bluetooth LE and other low-power wireless applications that were previously not possible with a single-chip solution. 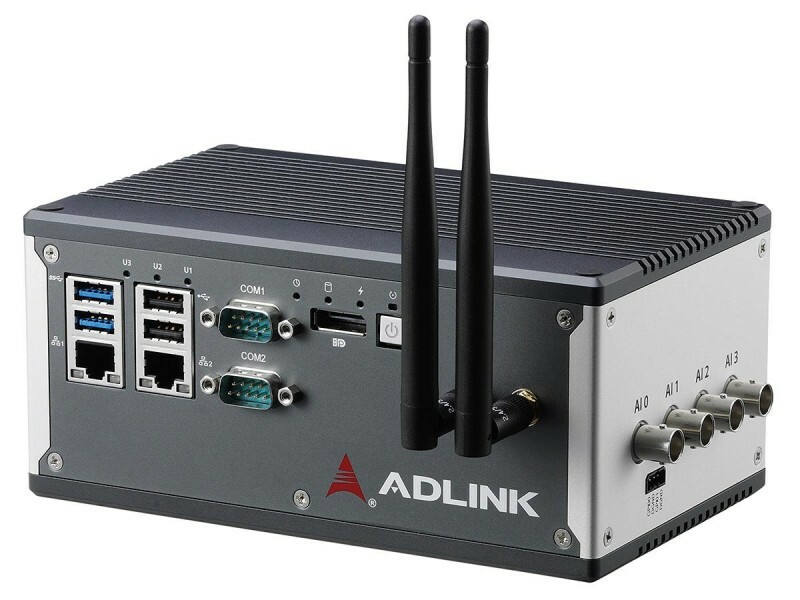 The SoC combines the Arm processor with a 2.4 GHz multiprotocol radio architecture featuring -96dB RX sensitivity and an on-chip PA boosting output power to a maximum of 8 dBm. The SoC is supplied with the S140 SoftDevice, a Bluetooth 5-certified stack which supports all the features of the standard and provides concurrent Central, Peripheral, Broadcaster and Observer Bluetooth LE roles. 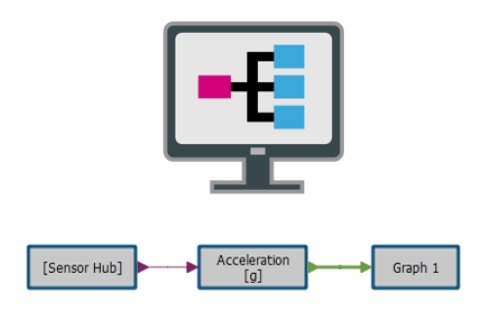 STMicroelectronics offers a tool called AlgoBuilder designed to take the coding out of firmware development by letting users build sensor-control algorithms graphically with library modules, ready to compile and run on an STM32 microcontroller. AlgoBuilder provides libraries such as logic and mathematical operators, signal processing, user inputs, vector operations, and many others. Turnkey algorithms for commonly used functions such as sensor hub, motion-sensor calibration, activity recognition, motion intensity, and pedometer are included. Users can also add their own custom functions to the AlgoBuilder libraries. AlgoBuilder provides an environment for connecting them with other logic to create a complete firmware project ready to compile using an STM32 IDE (Integrated Development Environment) such as TrueSTUDIO for STM32, SW4STM32 System Workbench for STM32, IAR-EWARM IAR Embedded Workbench for Arm and Keil µVision MDK-ARM-STM32. AlgoBuilder can generate firmware for deployment on various STM32 platforms. These include the NUCLEO-F401RE and NUCLEO-L476RG development boards with the X-NUCLEO-IKS01A2 MEMS-sensor expansion board, and ST’s SensorTile IoT module. The SensorTile integrates a STM32L476JG ultra-low-power MCU, motion and environmental MEMS sensors and Bluetooth Low Energy (BLE) connectivity. 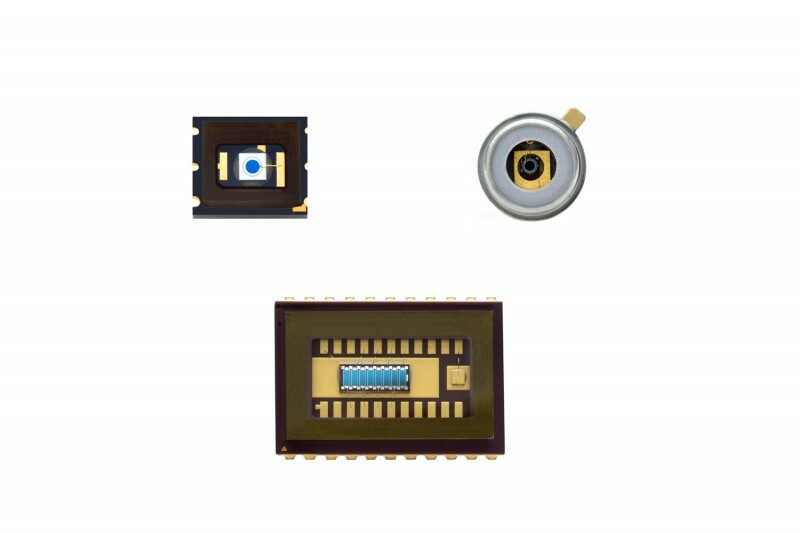 The Series 9 from First Sensor offers a wide range of silicon avalanche photodiodes (APDs) with very high sensitivity in the near infrared (NIR) wavelength range, especially at 905 nm. With their internal gain mechanism, large dynamic range and fast rise time the APDs are ideal for LIDAR systems for optical distance measurement and object recognition according to the time of flight method. Application examples include driver assistance systems, drones, safety laser scanners, 3D-mapping and robotics. Using its own semiconductor manufacturing facility and extensive development capabilities, First Sensor can adapt its silicon avalanche photodiodes to specific customer requirements, such as sensitivity, gain, rise time or design. Embedded Boards. (6/26) The focus here is on both standard and non-standard embedded computer boards that ease prototyping efforts and let you smoothly scale up to production volumes.